Corn leaf samples from Champaign County, Illinois, have tested positive for the bacterium Burkholderia andropogonis. This bacteria is the cause of bacterial stripe disease. The samples were tested at the University of Illinois (U of I) Plant Clinic. The positive results were reported to the Illinois Department of Agriculture and the United States Department of Agriculture (USDA). 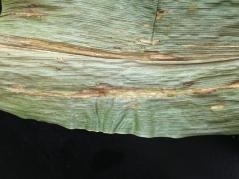 “Bacterial stripe foliar symptoms unfortunately are similar to other endemic bacterial leaf pathogens of corn, such as Goss’s Wilt and Stewart’s Wilt,” U of I Plant Clinic Director Suzanne Bissonnette said. “Lesions appear initially as lime-green to yellow diffused discoloration running parallel with leaf veins. As the lesion matures, brown necrotic streaking is evident in the center of the lesion; lesions may be 2 to 5 inches or more in length." Bissonette said the disease is new to Illinois and there's little historical information available to predict how the disease will effect corn yields. The bacterium can also infect Johnson grass, sorghum, rye and clover, and it becomes more severe during periods of wet, humid weather. Bissonette said growers should be on the look out for this disease in corn next season. “Be aware that symptoms of this disease may be confused with other bacterial leaf blights so lab testing may be necessary to differentiate,” she said.